BLUEJACKET IS A PRODUCTION CRAFT BREWERY LOCATED AT 300 TINGEY STREET SE IN WASHINGTON, DC. DUE TO THE DEMANDS OF OUR BREWING SCHEDULE, WE ARE ONLY ABLE TO OFFER TOURS OF OUR FACILITY AT DESIGNATED TIMES. 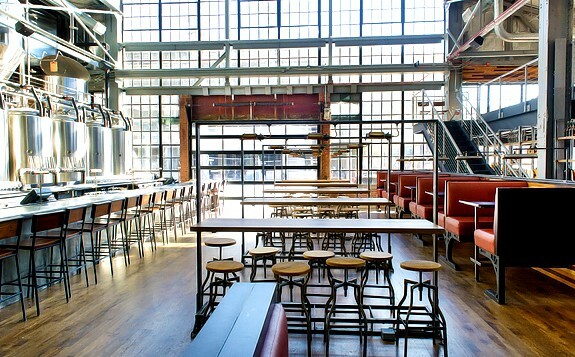 HOWEVER, THE ARSENAL—OUR BAR AND RESTAURANT WITHIN THE BREWERY—IS OPEN FOR LUNCH AND DINNER DAILY. MUCH OF OUR BREWING OPERATION—FROM THE BREWHOUSE TO THE FERMENTATION VESSELS, SERVICE TANKS AND OAK BARREL-AGING AREAS—IS VISUALLY ACCESSIBLE FROM THE DINING ROOM AND BAR. WITH A PACKED HOUSE WHEN THE NATIONALS PLAY IN OUR NEIGHBORHOOD, WE DO NOT OFFER ANY BREWERY TOURS ON HOME GAME DAYS. YOU CAN FIND AVAILABLE TOUR DATES AND RESERVE YOUR SPOT FOR TASTING TOURS USING THE LINK BELOW. TO SCHEDULE A PRIVATE TASTING OR BEER & FOOD EXPERIENCE TOUR FOR A LARGE GROUP AT ANY OTHER TIME, PLEASE CONTACT OUR PRIVATE EVENTS MANAGER SARAH MELBY. FOR OUR BREWERY TOURS, WE OFFER TWO OPTIONS. TASTING TOURS ARE OFFERED ON SATURDAYS AT 1 PM. THIS TOUR INCLUDES A FULL TOUR OF THE BREWERY WITH FIVE TASTING POURS-OFFERED THROUGHOUT THE TOUR. EACH BLUEJACKET TASTING TOUR CAN ACCOMMODATE UP TO 15 GUESTS AND RESERVATIONS ARE REQUIRED. PLEASE USE THE LINK BELOW TO RESERVE. THIS SPECIAL BREWERY TOUR IS OFFERED EVERY FRIDAY AT 7 PM. UPON ARRIVAL, GUESTS WILL BE TREATED TO ONE OF OUR SIGNATURE DRAFTS, FOLLOWED BY A FULL TOUR OF THE BREWERY AND OPERATIONS WITH 3 TASTERS THROUGHOUT THE TOUR. 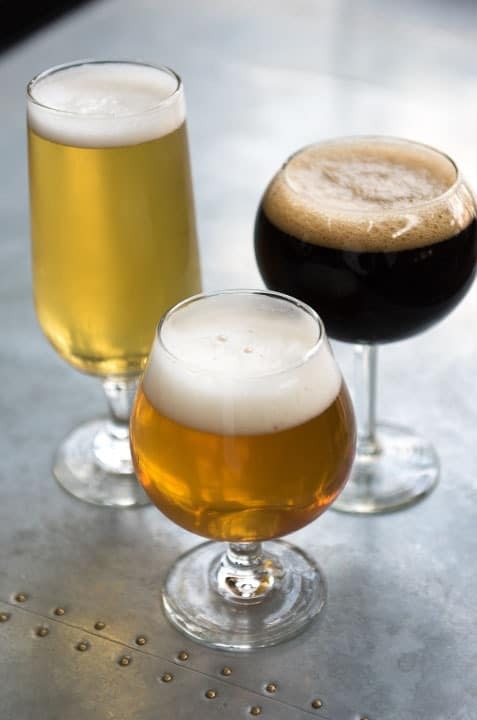 AT THE CONCLUSION, GUESTS WILL HEAD TO THE BOTTLE SHOP & TASTING ROOM TO ENJOY A FLIGHT OF 3 ADDITIONAL TASTERS EACH EXPERTLY PAIRED WITH A SNACK FROM OUR TALENTED CULINARY TEAM LED BY CHEF DE CUISINE MARCELLE AFRAM. THIS TOUR CAN ACCOMMODATE UP TO 20 GUESTS AND RESERVATIONS ARE REQUIRED. PLEASE USE THE LINK BELOW TO RESERVE. WE KINDLY ASK THAT YOU PROVIDE AT LEAST 24 HOURS NOTICE IF YOU NEED TO CHANGE OR CANCEL YOUR TOUR RESERVATION. TO CHANGE OR CANCEL A TASTING TOUR RESERVATION, PLEASE FOLLOW THE EVENTBRITE INSTRUCTIONS FOR REQUESTING A REFUND, OR EMAIL US AT TOURS@BLUEJACKETDC.COM. FOR YOUR SAFETY, WE KINDLY ASK THAT GUESTS GOING ON ANY BREWERY TOURS WEAR COMFORTABLE, CLOSE-TOED SHOES. WE HIGHLY RECOMMEND RESERVING YOUR SPOT ON OUR TASTING TOUR AND BEER & FOOD EXPERIENCE TOUR EARLY, AND WE ACCEPT RESERVATIONS UP TO 8 WEEKS IN ADVANCE. ADDITIONALLY, WE DO OUR VERY BEST TO START EACH TOUR ON TIME, SO WE ASK THAT GUESTS ARRIVE 10-15 MINUTES PRIOR TO THE START TIME. IF YOU ARRIVE LATE, WE WILL DO OUR BEST TO ACCOMMODATE YOU ON THE NEXT AVAILABLE TOUR OR WILL OFFER A REFUND IF THERE ARE NO MORE AVAILABLE TOURS THAT DAY. CAN I BRING MY CHILD ON A BREWERY TOUR? WE CERTAINLY WELCOME FAMILIES AT BLUEJACKET AND THE ARSENAL. CHILDREN UNDER 21 MUST BE ACCOMPANIED BY AN ADULT AND MAY GO ON EITHER THE BLUEJACKET TOUR OR THE TASTING TOUR. UNFORTUNATELY, WE CANNOT ACCOMMODATE CHILDREN ON THE BEER & FOOD EXPERIENCE TOUR. FOR THE BLUEJACKET BEERS & BITES TOUR, NON-DRINKERS MAY ATTEND FOR A REDUCED PRICE. TO RESERVE THIS TICKETING OPTION, PLEASE EMAIL US AT TOURS@BLUEJACKETDC.COM. WE ARE ABLE TO BOOK A LIMITED NUMBER OF PRIVATE EVENTS OR TOURS FOR GROUPS LARGER THAN 20. PLEASE CONTACT OUR PRIVATE DINING MANAGER, SARAH MELBY, WITH ALL INQUIRIES.